C4SS has teamed up with the Distro of the Libertarian Left. The Distro produces and distribute zines and booklets on anarchism, market anarchist theory, counter-economics, and other movements for liberation. 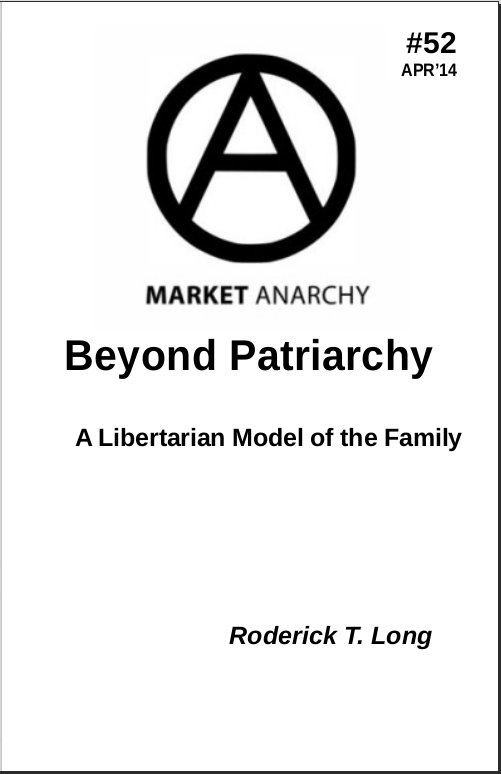 For every copy of Roderick T. Long‘s “Beyond Patriarchy” that you purchase through the Distro, C4SS will receive a percentage. Support C4SS with Roderick T. Long‘s “Beyond Patriarchy“. “Historically, human families have often been oppressive and exploitative institutions, in a way that animal families do not seem to be. The purest example of this is the Roman family, in which the male head of household (the paterfamilias) was legally entitled to put his wife and children (even grown children) to death. This aspect of family relationships is called patriarchy (‘father-rule’), signifying the subordination of wives to husbands and of children to parents. Those who defend patriarchy as ‘natural’ often point to the animal kingdom as a model; but traditionally, parental authority and sexual inequality have been far more pronounced in human societies than in most animal societies. Recent political developments — springing in part from the libertarian urge to subordinate patriarchal authority to individual rights, and in part from the welfare-liberal urge to subordinate patriarchal authority to that of the state — have weakened the institution of patriarchy, but not eliminated it entirely. . . How might families in a truly free society develop beyond this patriarchal paradigm?